Earlier this year, Google said that offline turn-by-turn navigation would eventually be available to Google Maps users. However, the feature is still missing as we type this. The same goes for Apple Maps: at the moment, the app requires an internet connection in order to provide turn-by-turn navigation. Thankfully, this doesn't mean that Android and iOS users can't get offline turn-by-turn navigation. In fact, there's a certain third-party app that's offering this right now for free. The app that we're talking about is HERE Maps, formerly known as Nokia Maps, and soon to be acquired by a powerful consortium of German carmakers (including BMW and Audi). HERE Maps is available on Android and iOS for free - no in-app purchases, no ads. After you download HERE Maps on your Android or iOS device (see the source links at the end of this article), you're almost ready to benefit from all of its features. In order to have access to offline turn-by-turn navigation, you first need to download maps for the areas that interest you - this is done from HERE Maps' main Menu. You can download maps for entire continents, entire countries, or just for particular states. Needless to say, maps for entire continents are very large (for example, North and Central America will occupy about 7 GB on your device). But, if you have enough free space and you're using a Wi-Fi connection, you should have no problems downloading all the maps you want. Once you've downloaded the map or maps you need, you're ready to start navigating offline. Just search for the place you want to go to, and hit the Directions button that's positioned in the lower right corner of the screen. Alternatively, you can plan a route from a set location to a set destination. Both car navigation, and pedestrian navigation are provided (as a bonus, there's also public transportation info available). If you want to keep your device connected to internet, but don't want HERE Maps to use any data, there's a special "Use app offline" option that you can enable from the main Menu. All in all, HERE Maps is pretty easy to use, so go get it if you need offline turn-by-turn navigation. HERE's main Menu can be accessed from the upper left corner. In the main Menu, you'll find (among other things) the option to download maps. Maps that are organized by continents, and can be downloaded with a simple tap. The HERE Maps icon is unmistakable. When it comes to searching for places, you can do that easily from the dedicated bar at the top. Once you've found the place that interest you (Santa Ana Freeway, in our case), tap on the Directions button seen on the lower right corner to start navigating. Or you can plan a route from point A to point B by taping on the Directions button next to the Search bar. LOLLll this app was a Microsoft/Windows exclusive... received no attention. Now that it is cross platform, no mention of Windows is made... who says PhoneArena has a bias. Bravo! Been using it on my Lumia 1520 for a while now, and also on my Nexus. I have been using Offline Turn-by-Turn navigation on Google Maps for at least 2 years now... given that you start with internet (for instance, at a wifi on a Hotel or Mall) and then you go offline in the car.... the navigation still works all the way, even redirecting as long as you don't go too far off the route. I used this on a trip to San Diego where I only relied on public WiFi, not even roaming... I am from south america. The obvious limitations are that you can't make another search or change while offline... but as soon as I got to the next place I was able to use another wifi to make my next route. Offline Google maps are worse than smoke signals, they're frustrating to use and only cover a really small area. Google Maps is horrible and offline it's just plain crap! HERE offline maps is so much better than google's offline solution, it's impossible to communicate just how much better HERE is. Why suffer with the limitations you describe with Google maps, when you get for free with HERE? I will say that HERE isn't perfect though. Their navigation isn't the greatest as far as showing the next turns and exits, though. 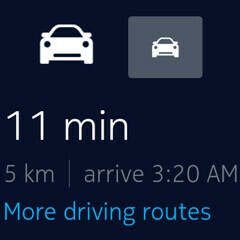 Here Maps, best navigation app PERIOD! I am HERE. Feels nice when sharing my location with that line. Always used Nokia Maps/here since it came with offline nav. Offline mode means longer battery life too.